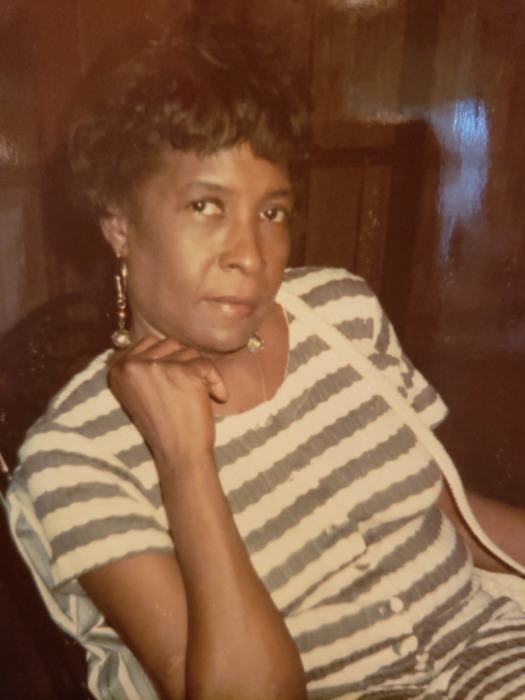 Georgia Mae Martin, age 77 of 804 Spring Moore Ct., Sanford, NC passed on Thursday, April 11, 2019 at UNC Hospitals Chapel Hill. Georgia Martin, loving mother, devoted grandmother and great-grandmother, was called home to God’s kingdom on April 11, 2019. Georgia Mae Judd was born on February 3, 1942, the third child of the late Lonnie Smith Judd and Lemuel Judd in Sanford, North Carolina. Georgia spent her early years growing up in Sanford, North Carolina with her four siblings and graduating high school at the W.B. Wicker School. Georgia was a very popular student and played basketball for the school during these years. Georgia moved from Sanford, in the early 60’s to Brooklyn, New York, got married and raised four children. One loving son, Mr. Ronald Thomas, preceded her in death in 1991. Georgia was a strong, resilient, and feisty woman. You never had to guess or wonder how she felt about any issue. She was always direct, honest, and to the point; traits that made her genuine. Georgia loved life and was devoted to her children and family. Georgia was a very compassionate and caring person. She cared deeply about others and their struggles, which led her into a career as a trained Home Health professional in New York City for many years. Georgia spent her adult working years caring for people with serious medical issues that restricted them from living in their homes independently. Georgia loved this work, which helped many with serious medical issues to live in their homes, as opposed to living in a nursing home or hospice. In 1999, Georgia married the late Larkland “Terry” Theodore Martin, Jr. During their marriage, Terry retired and they relocated to Chesapeake, Virginia until Terry’s passing in 2001. Georgia remained in Chesapeake a few years after Terry’s passing where her desire to help others led her to become a licensed specialized foster parent for Children’s Services of Hampton Roads. Georgia opened her heart and home to children in foster care with special needs, while also helping her granddaughter, Shana R. Royster complete her college degree. Georgia received several awards and certificates for outstanding service as a specialized foster parent. In her later years, Georgia decided to relocate back to her birthplace in Sanford, North Carolina. Georgia joined and was a dedicated member of the Mt. Calvary Baptist Church in Sanford until her health declined to where she was no longer able to attend. Georgia leaves to cherish her life legacy, a daughter, Gwendolyn Annette Judd; two sons, Mr. William Darrin Thomas and Mr. Lemmuel Harrison Thomas; a granddaughter that she helped raise and her husband, Mrs. Shana R. Royster and Mr. Henry Royster; four other grandchildren, Ronald Thomas, Jr., Lenaisha Mone’ Thomas, Jordan Terry Thomas, and Jazzlyn Leniya Thomas; two great-grandchildren, Gweneth Royster and Shane Royster; a sister, Mary Springer; two brothers, Mr. Limmie Judd and Mr. Jimmie Judd; and a host of nieces, nephews, cousins and dear and close friends that loved Georgia. Rest in Heaven Georgia, you will be dearly missed.